I signed up to be part of an online swap with The Scrappy Girls Club about a month ago since it has been forever since I have been part of a swap. 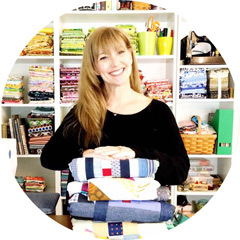 I have about 10 million scraps and Heather Valentine from The Sewing Loft is the swap mistress so I knew it would be AMAZING to participate in this fun and active group. I choose the Cat-Eye Pouch pattern by Sherri Sylvester from Thread Riding Hood. This pattern is FREE and also is one of the best written patterns EVER! It makes the most finished looking pouch without the fussiness I have encountered before. Easy Peasy inner lining and zipper construction :o) You do not even have to own a zipper foot! I used fabrics by Alison Glass for Andover. The quilted front did made the construction a bit tricky. The layers were thick but going slow while stitching and using a larger needle were very helpful. 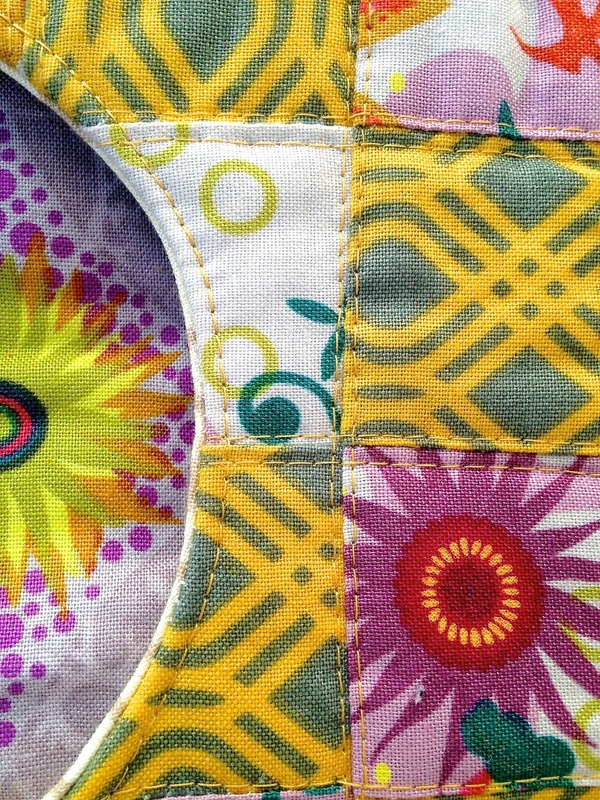 I used Schmetz Microtex 90/14 and Aurifil 50wt for all of the piecing, quilting and construction of this gorgeous pouch! 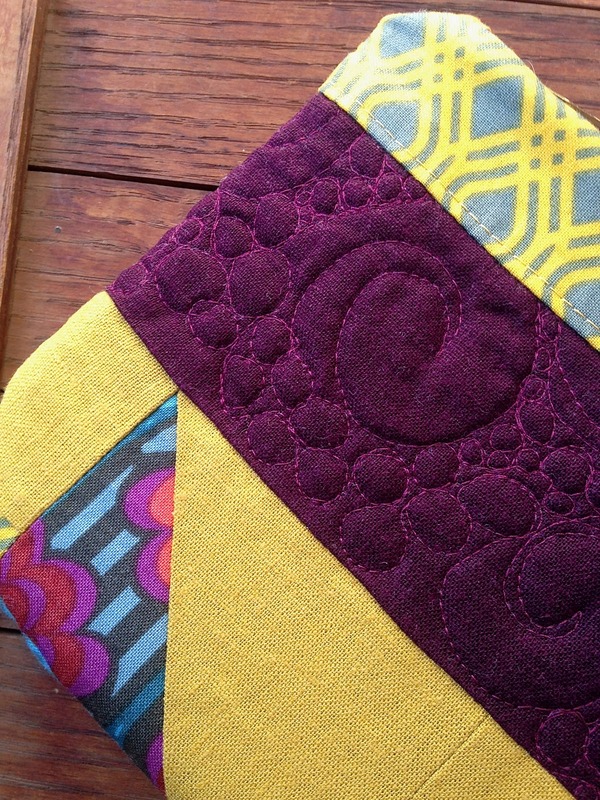 The Aurifil blog currently has a two-part series by Rhonda Pierce from Schmetz needles on how to match up your needles and threads for less thread skips, snaps and overall sewing headaches! Make sure to check it out before you start your next project! Also, for sewing layers, I filmed a video with Martingale press for the book Kitchen Stitches sharing some of my tips for successful Sewing With Lots of Layers. I hope you will check it out for help with those pesky layers! I decided on using a vibrant lining fabric for a happy surprise! It is always fun to unzip a pouch and see COLOR! And the purple zipper is AWESOME! I had a great time making this pouch for my partner. I will add in some lovely treats just for her! I hope she enjoys it :o) I was so happy to have this WIP finally finished! For some odd reason, this reminds me of The Eye of Sauron from The Hobbit books. I am really liking this pouch; but, I am not sure if I have the mad skills to make one. Fabulous pouch! I love the design and your jazzy fabric choices.